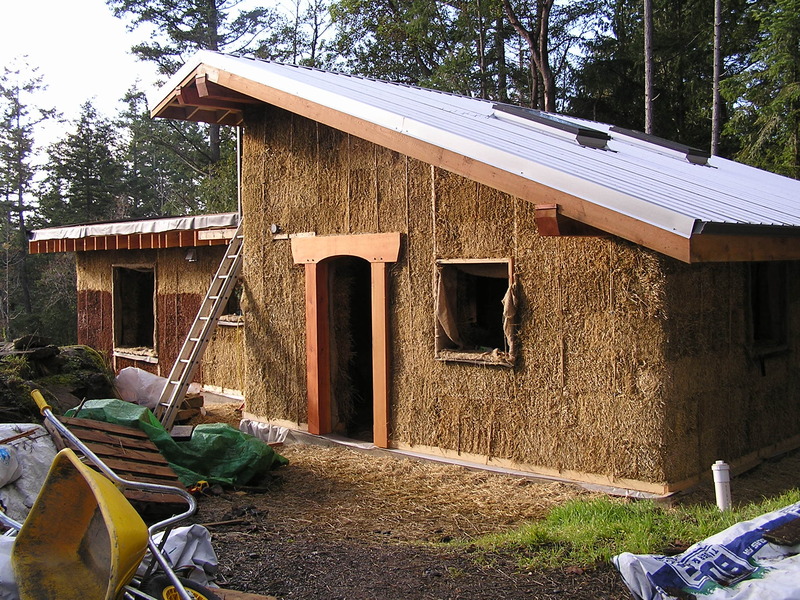 A comment that we hear regularly from those visiting our strawbale house is that not everyone who wants to have a naturally built house is capable of doing it themselves. Indeed, it takes a lot of hard work, research, material searching, building skills, tools, and time to go through the process as a home builder of any type of project. Anyone without such prerequisites but with a desire and willingness to learn certainly can go for it, but there are many out there for whom it is more realistic to hire someone else to build them a home. 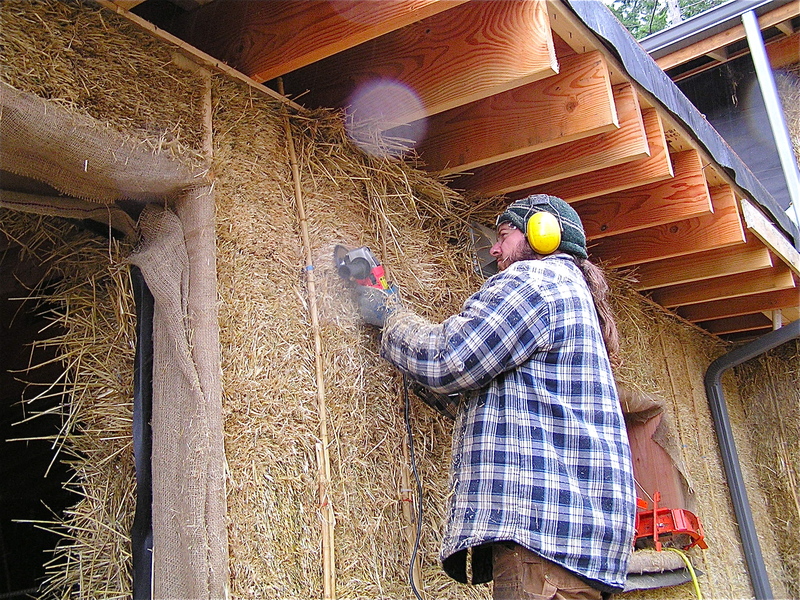 This is prevalent within the conventional building industry, but where does one look to find a straw bale crew? 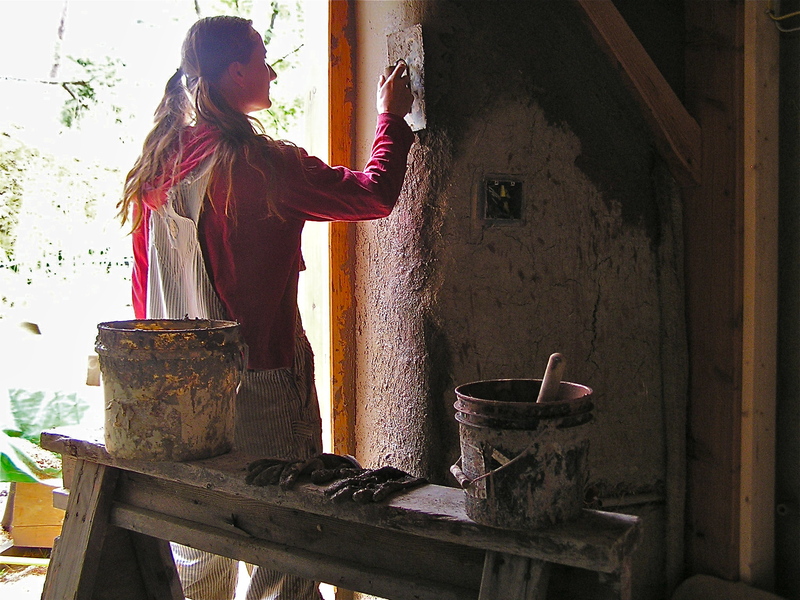 A natural plaster expert to source materials and use their knowledge of crafting healthy walls? What about an architect who will consider the natural light and water conditions of your chosen spot? All of these job positions are readily available for the standard house, but difficult to find for alternatives. 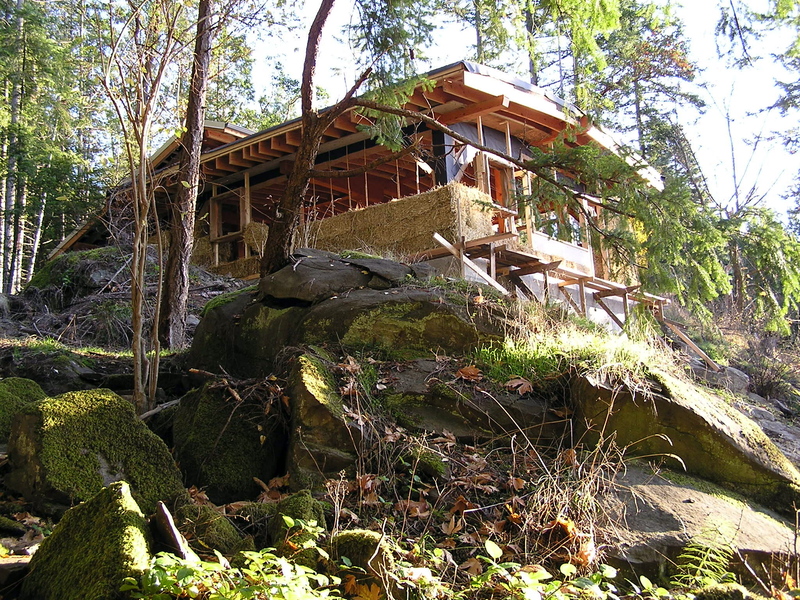 On Pender Island, a group of people wanting to promote various aspects of natural building have formed the Eco-Homes Network, in hopes of being able to provide services and information for anyone seeking to build a healthy home, as well as networking with other builders in the community to create a greater awareness of alternative materials and systems. 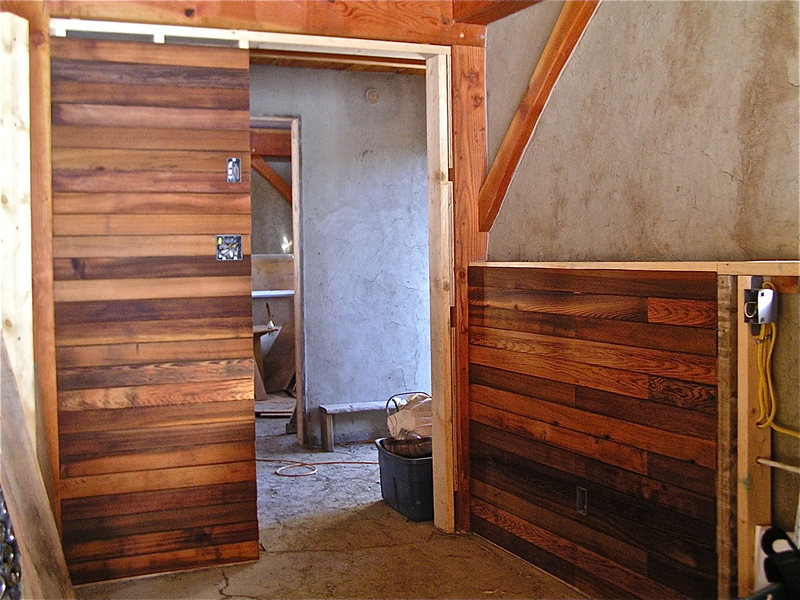 Education for clients as well as builders is a large step towards integrating healthier building practices into any house or project, whether it is classified as “eco-friendly” or not. Why limit ourselves with labels and categories? Any system that takes pressure off the resources of the earth and saves money in the long term is just a good idea to consider. 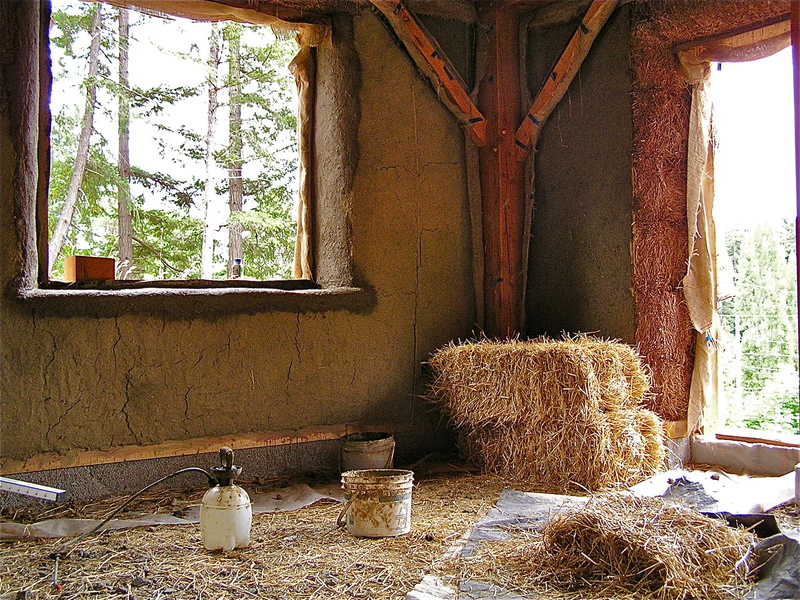 The Eco-Homes Network consists of Rob Zuk – a solar systems consultant, Ken Rempel – an architectural designer, Garrett McLeod – a traditional timber framer and carpenter, Colin Hamilton – artistic woodworker and natural builder, Tracy Calvert – an extensive natural builder and master of earthen plastering, and Jude Farmer – a woodworker and man of many skills. In fact, everyone in the group has many crossover skills and knowledge spanning many years of different experiences within the building industry, including roofing, tiling, stonework, workshop leadership, landscaping, flooring, and planning. 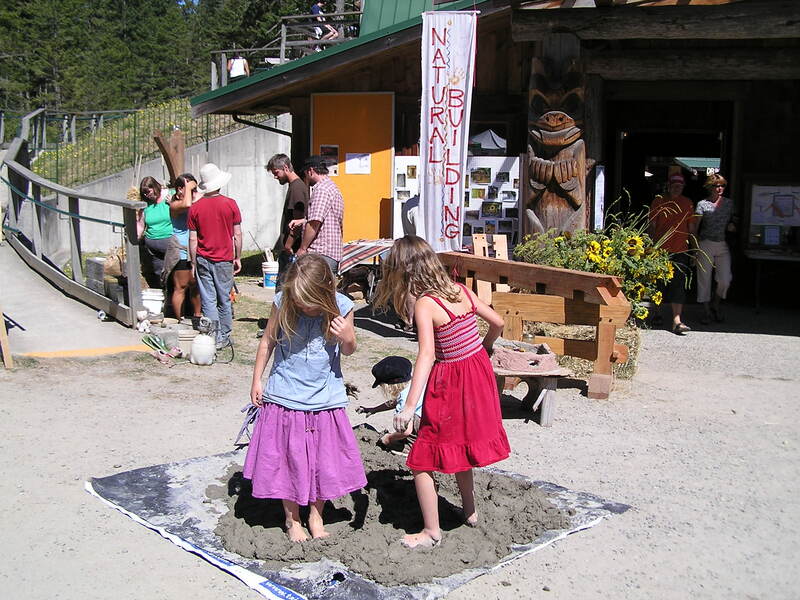 For two years, the Eco-Homes Network has set up a demonstration zone at the Pender Fall Fair and has hosted an eco-homes tour as part of an effort to educate people about natural building practices, and to showcase the many beautiful homes around us that incorporate different aspects of the industry. 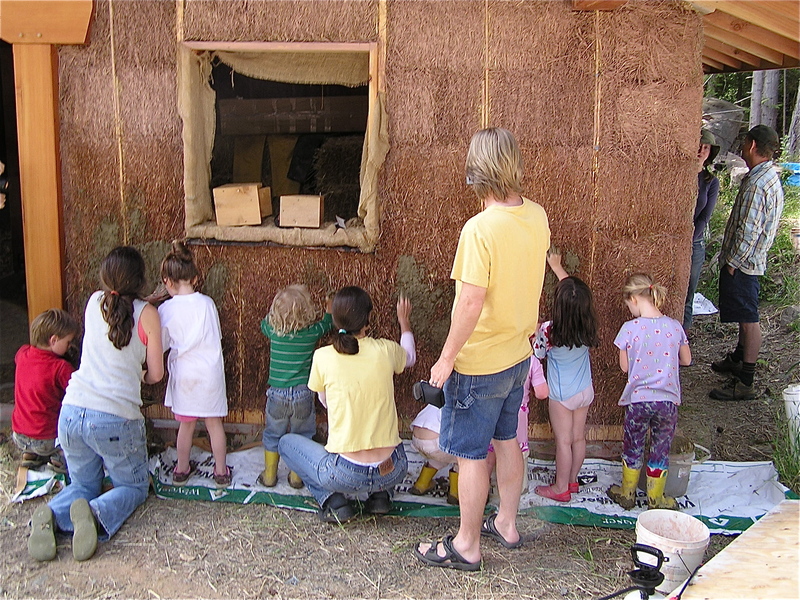 At the Fall Fair, everyone has been invited to squish their toes in cob and plaster mixes, and try their hands at spreading the mix over a demonstration wall of bales in a timber frame. 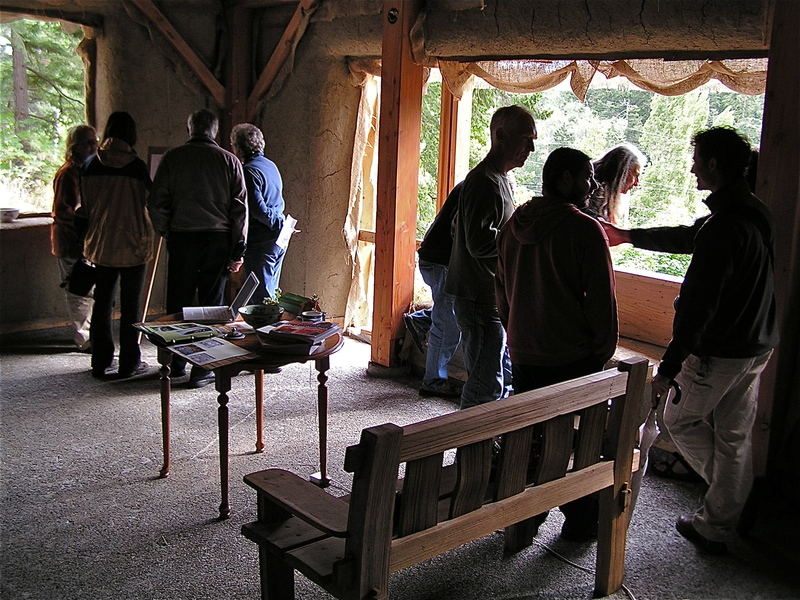 There also has been many books to gaze through, knowledgeable people to talk to, and a photo board of projects to look over. 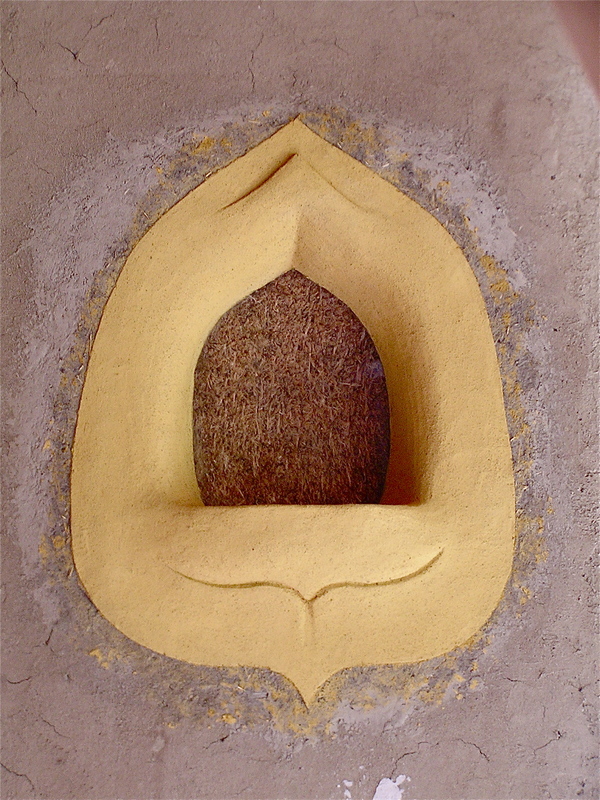 Many people get a good sense of the simplicity, creativity, and beauty that encompasses the building of a natural house. 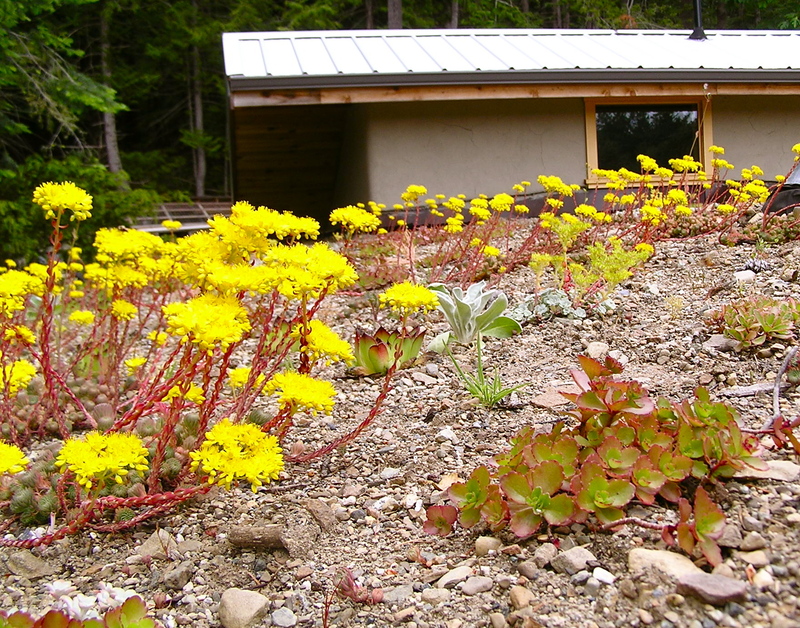 The Eco-Homes tour, which takes place a week later on Labour Day, is a self directed tour of up to 10 houses around the island, and has showcased houses made with chip-slip walls, strawbale, cob, cordwood and Faswall blocks (compressed recycled wood chip blocks), and including features such as earthen floors, living roofs, natural plaster, rain water catchment systems, hydronic in-floor heating, solar hot water, passive solar, composting toilets, and countless other details and creative touches that make up a complete picture of a natural house. 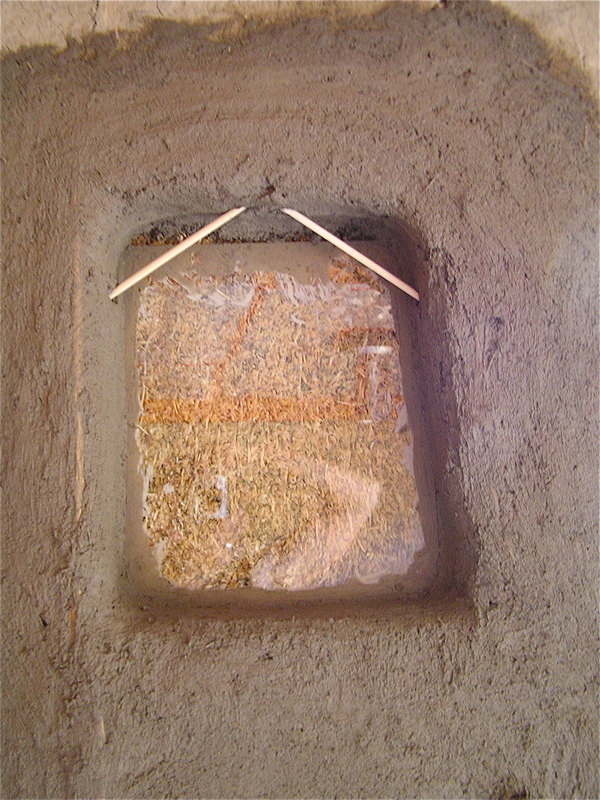 Some of the houses have been in the construction phase, allowing visitors to see the layers of some of the processes. 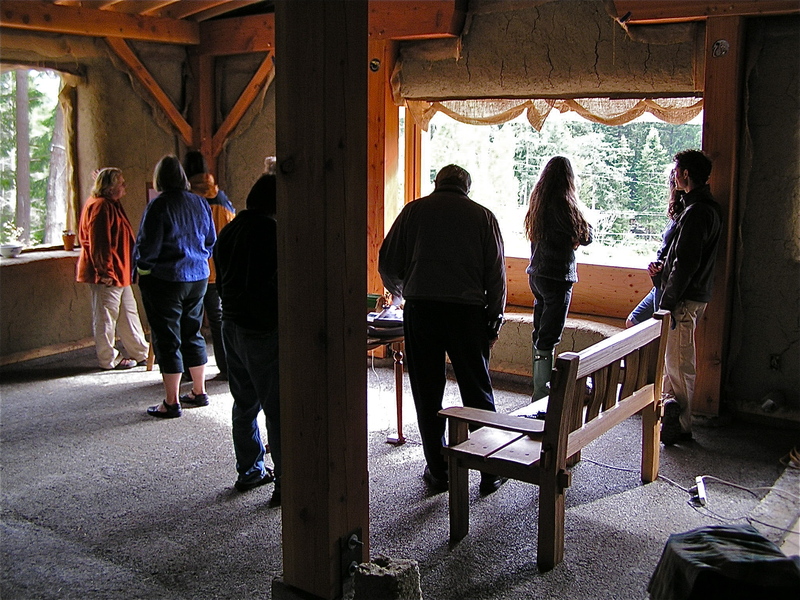 There have been over 150 people from the locals to travellers from the mainland and Vancouver Island each year, asking many questions and hopefully taking some ideas back to their own homes. 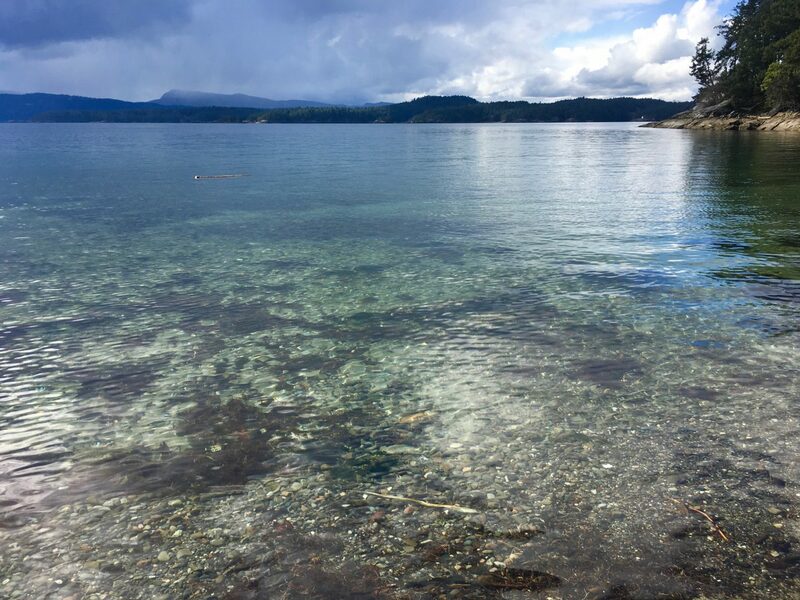 All proceeds from the previous tours have gone to the Pender Community Hall and to the Pender Island Farmland Acquisition Project. This year, proceeds will help the growing Pender Community Transition movement, to build a more sustainable island. 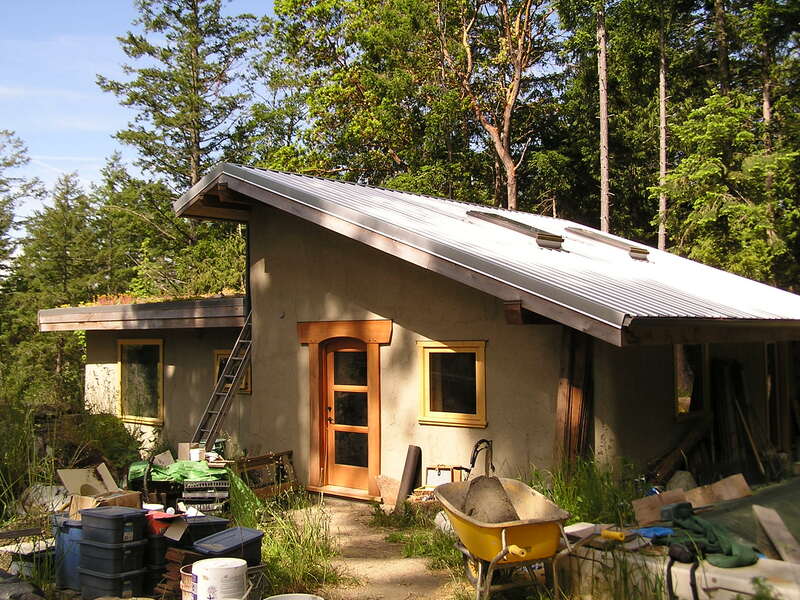 Our building site is perched on the top of a bedrock slope facing due south, but with a longer east/west side, so while we have full sun all year, we also need lots of insulation to capture the rays with as much passive solar practices as possible. 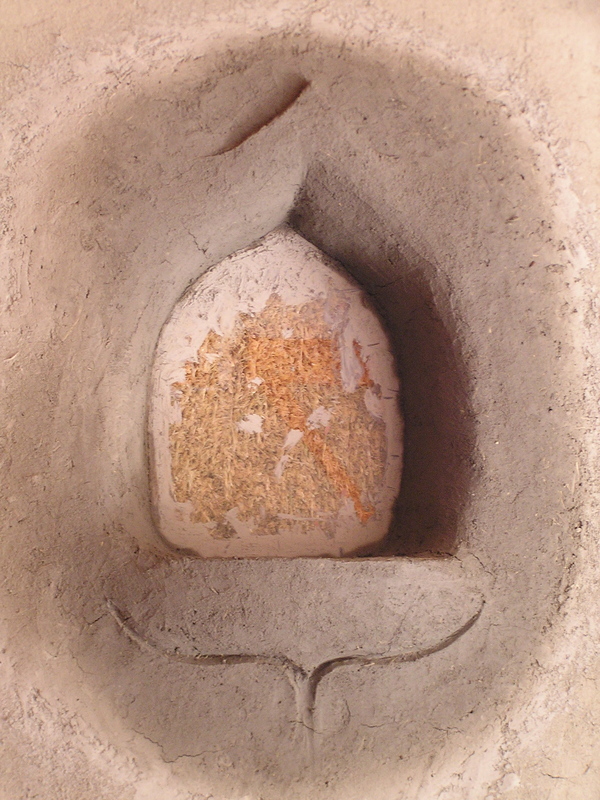 The rectangular shape of the space available between the outcrops of rock made the use of bales easy to apply. 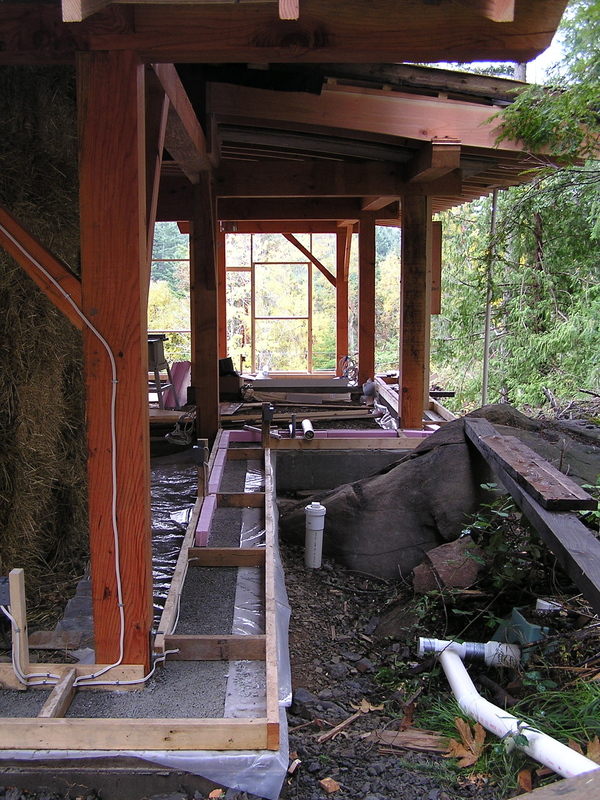 The bales provide infill walls only, as we designed the timber frame structure to hold the weight of the roof, which extends out with a 2 and a half foot overhang on all sides to keep our rainy climate away from the walls. 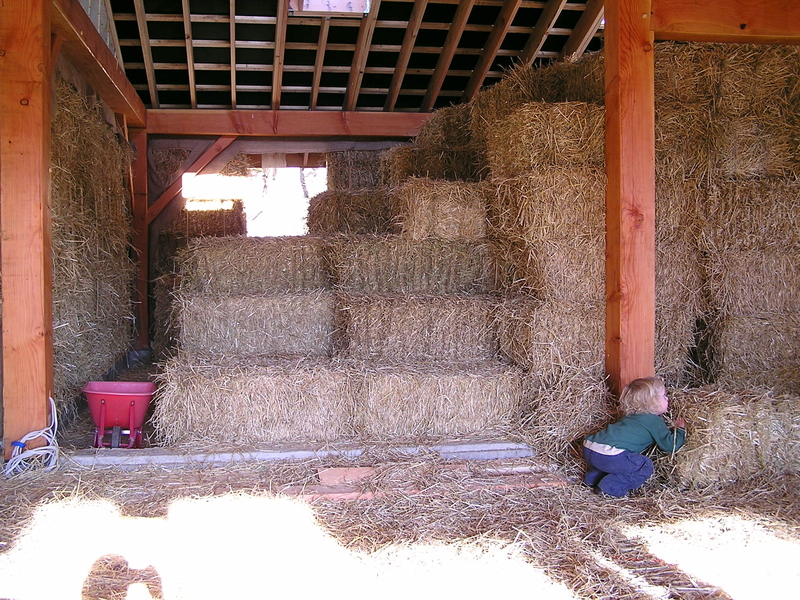 All the strawbales came from Mitchell’s, a family owned farm on the Saanich Peninsula. 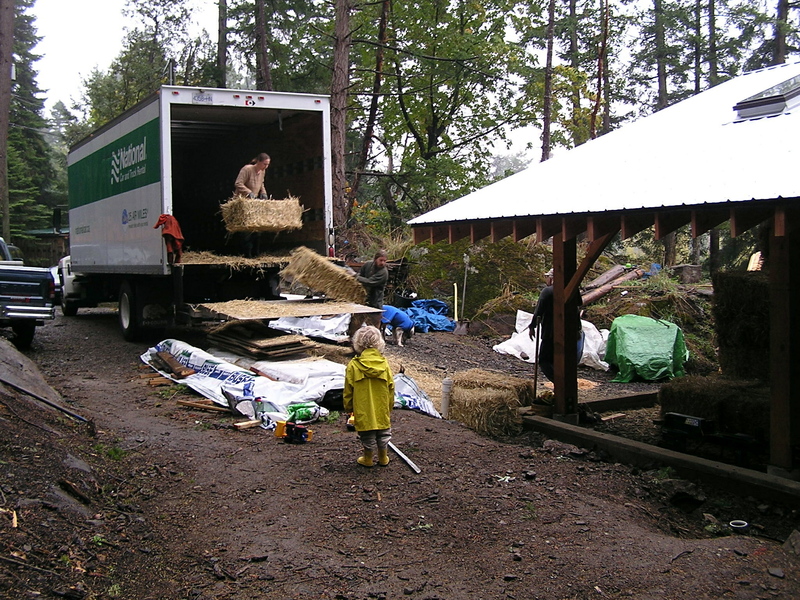 They had an excess of barley bales that year, and as we inquired about 700 bales needed for our house as well as for a workshop that our friends were building at the same time, they were happy to help with a reduced cost and extra arms loading them into the moving truck that we rented to move them over to the island. 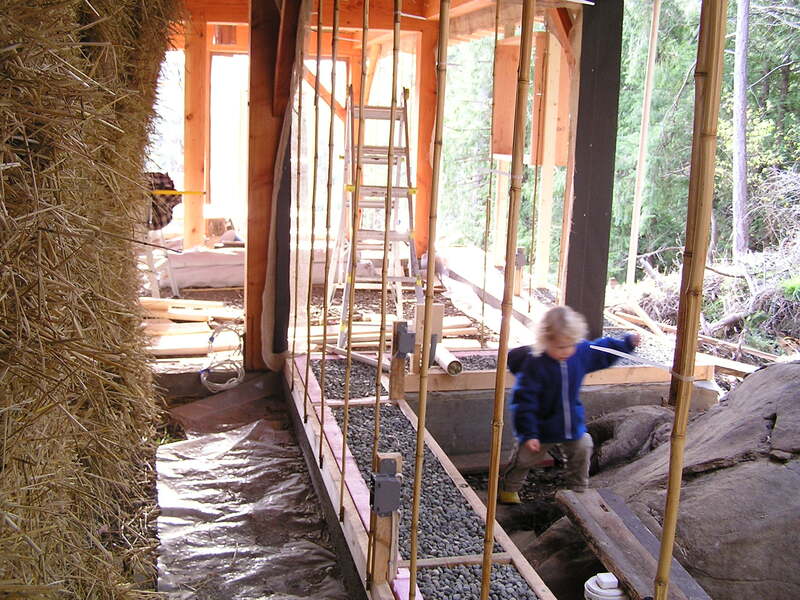 We used the structure of our roof and timber frame as a place to stack all the bales together while we worked on a few things that needed to be in place before the bales went into the walls. 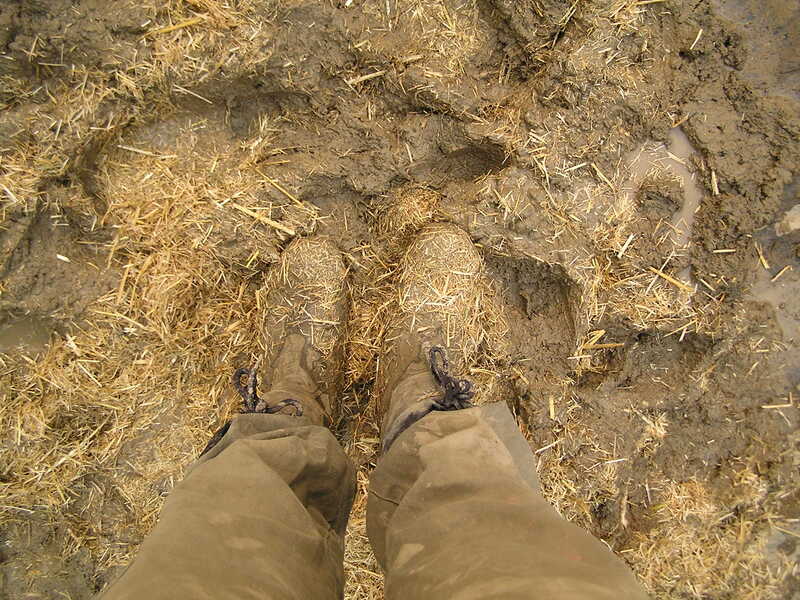 We constructed the toe-ups for the bales- a step of sorts that the bales sit on. 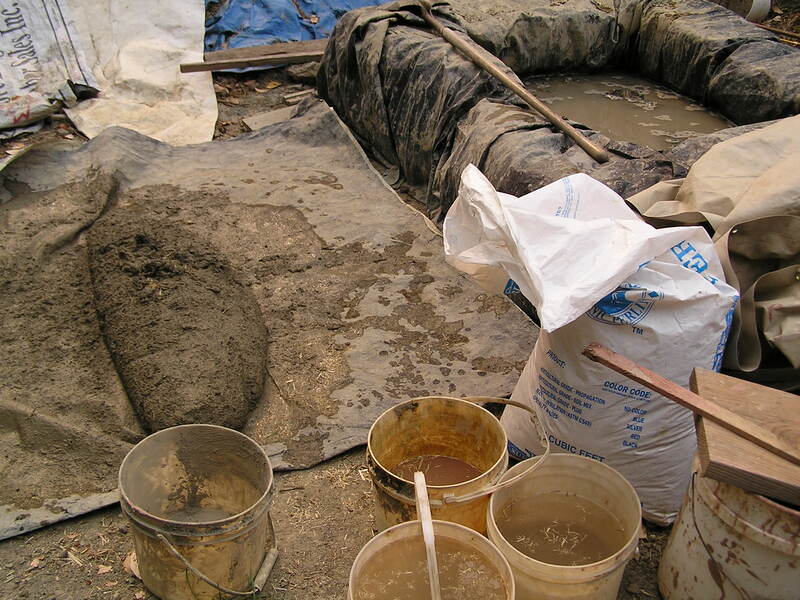 This is a path of 2×4 lumber on it’s side, bolted into the foundation, and filled with drain rock. We heard of people using crushed glass (from recycling depot), or corks (lots of trips to the recycling depot!) or anything that provides fill with air gaps. 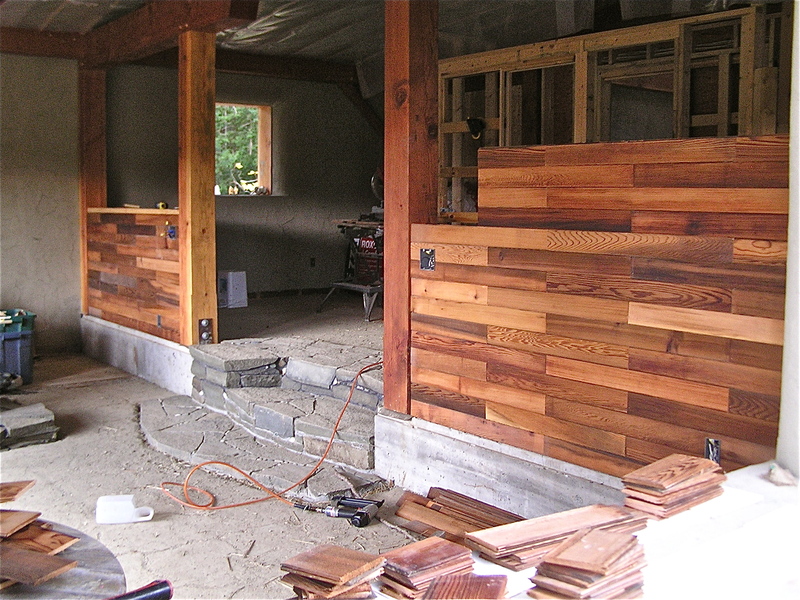 We also used these toe-ups as a course for our electrical wiring, running the wires inside the lumber then up to our electrical outlets that were posted at the required height up from the 2×4, and being essentially free standing from the bales. 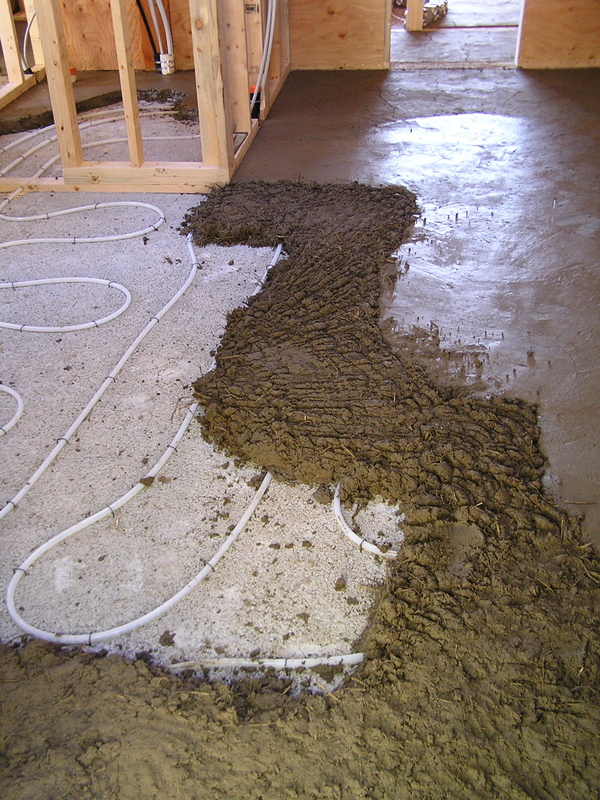 We protected the wires from the drain rock with a small piece of rigid foam insulation. 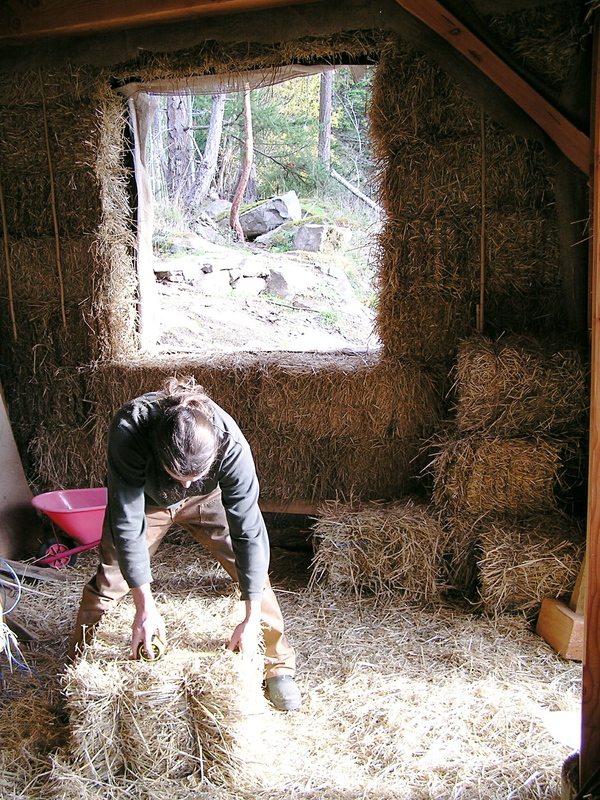 We did this for a few reasons, the main reason being that the electrical inspector wanted to see the rough wiring before the bales potentially hid them from view, and we didn’t want to get partway through our wall stacking then have to wait for him to make his visit, which can be the case if wires are run between bales. 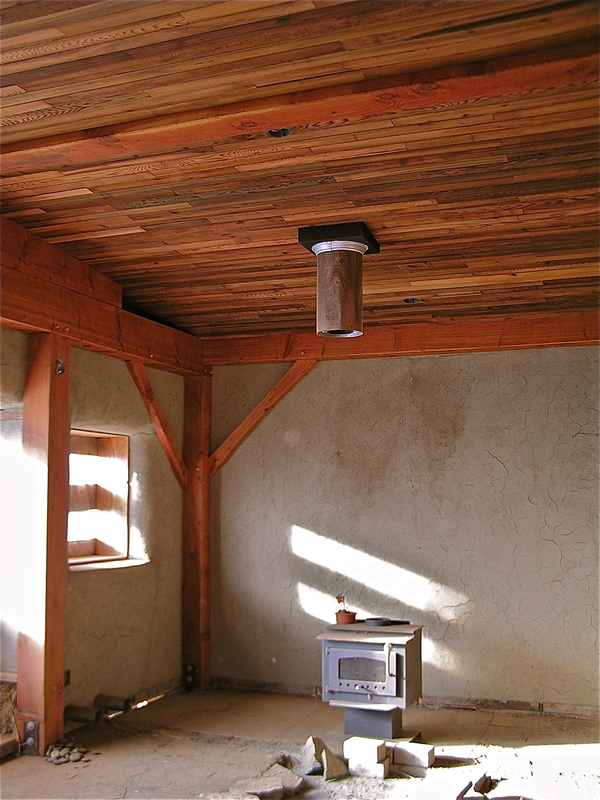 We also wanted to run the wires up the backs of the timber frame to the places that would need wiring up high. We stapled strips of burlap all along the places where the bales would come up next to wood, and a strip of building paper on the outside of the burlap. This was more for the plastering stage, but it was essential to do it before the bales went into place. 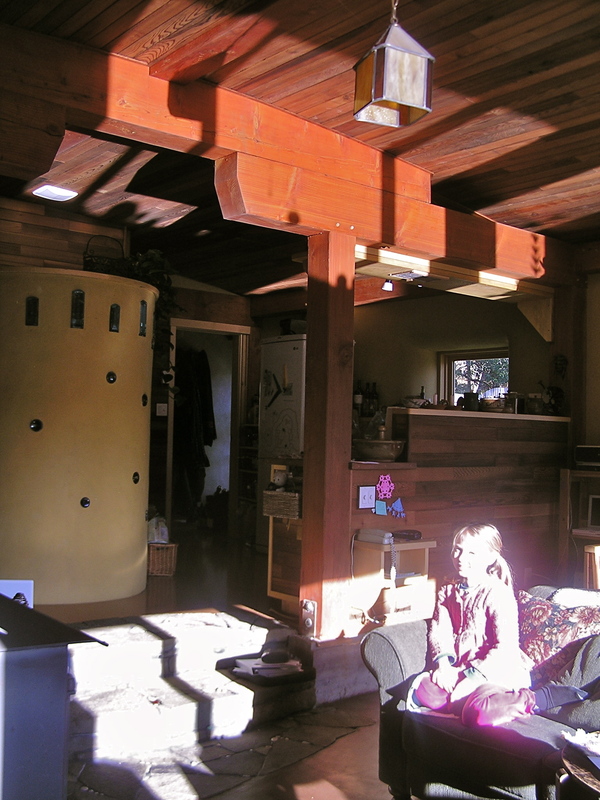 We then posted bamboo poles on one side of the toe-ups up to the height of the top beam. This was to be a part of our exterior pining system. 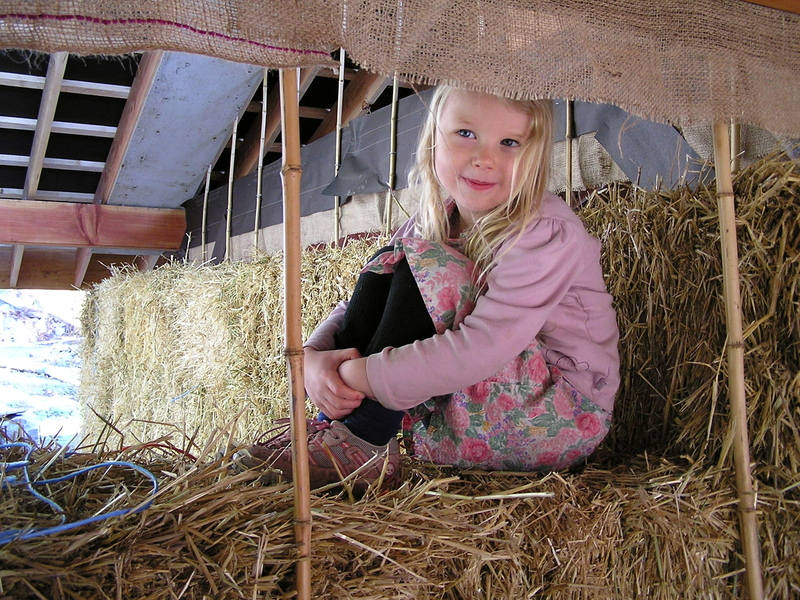 After the bales were in, we placed bamboo poles on the other side then sewed them together with a giant needle and baling twine through the bales, inside to outside. 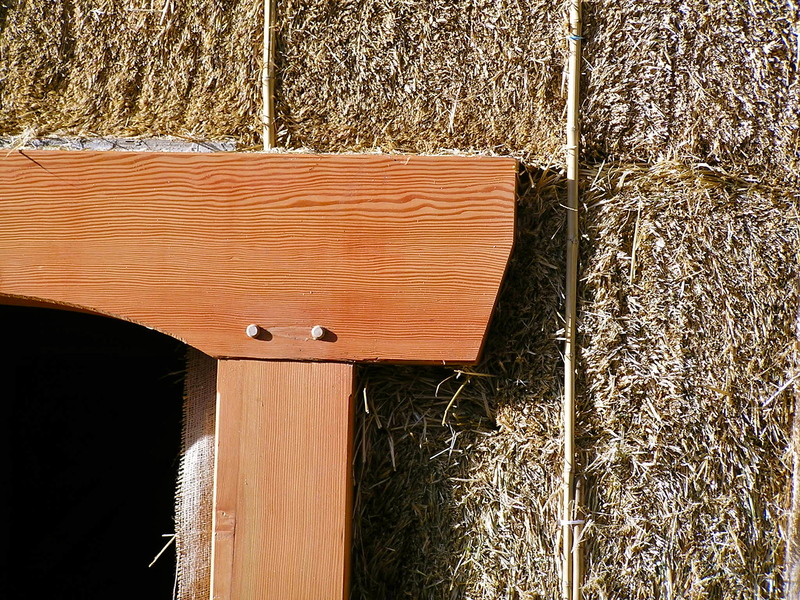 We also put in place all the window bucks, securing them to the timber frame and the toe-ups so that they would not shift with any settling of the bales. 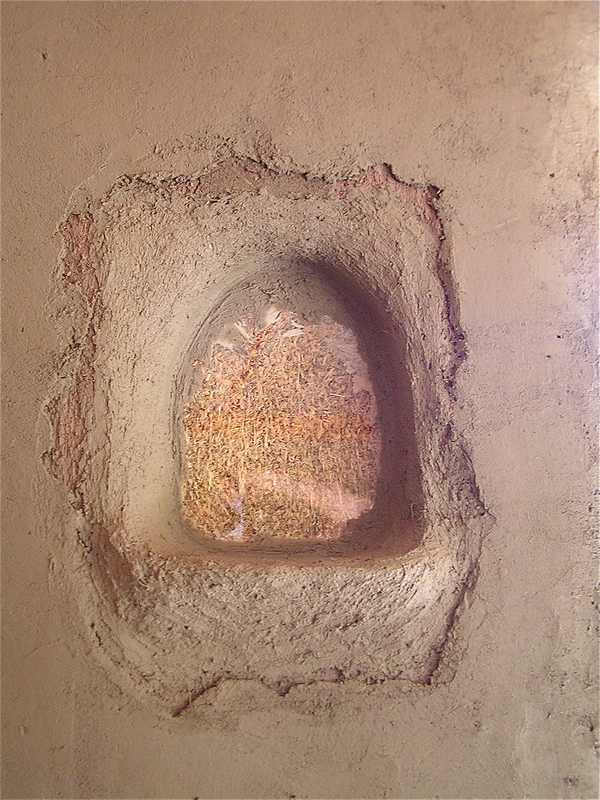 This created more detailing of the bales around the framing, but we had heard stories of frames shifting out of square and plaster cracking, so we decided to go with the rigid framing to avoid potential problems. Finally we started building the walls, and with lots of eager hands! Many of our friends had asked to come and take part, so we invited anyone who wanted to help. We had a rotation of 4 or 5 people everyday for the week that it took to fill in the walls. 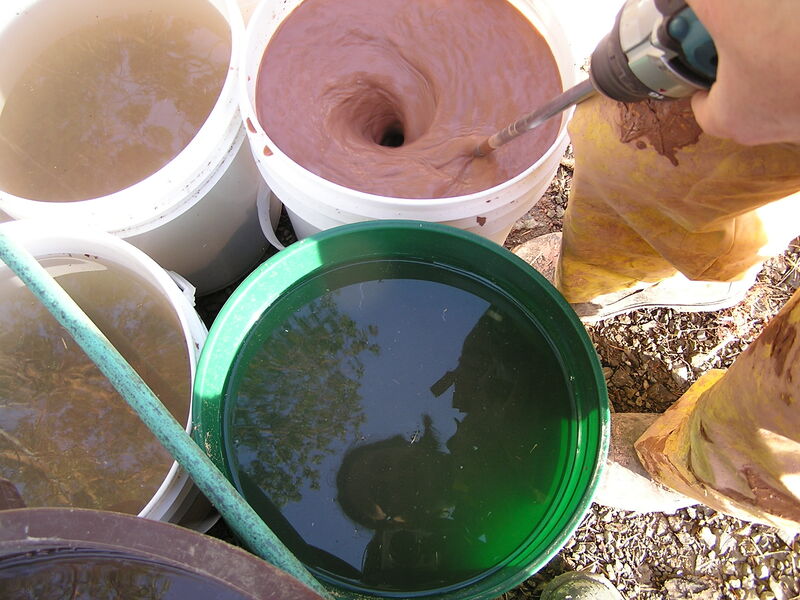 Although it was now november, we had a beautifully dry and sunny week to work in. 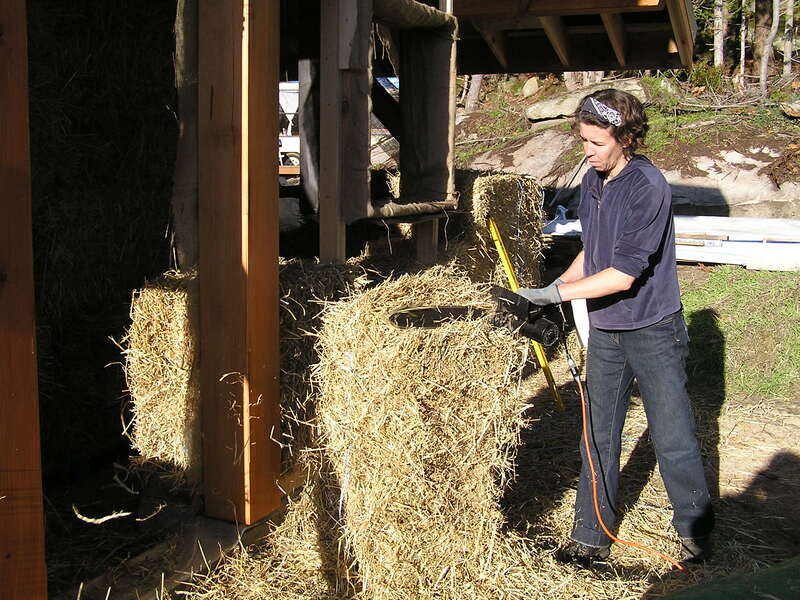 We learned how to reshape the bales to fit smaller spaces, either with a small electric chainsaw, or by splitting them and retying them with that giant needle. 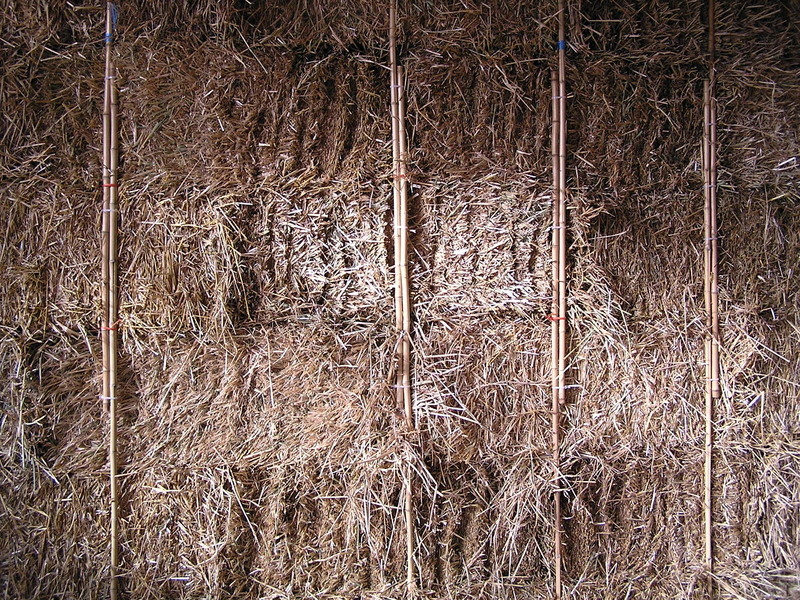 We used zip-ties to tie the bales together end to end through the baling twine, and the fact that the twine on the bales was so tight it was hard to slip a zip-tie under them was a good sign that these tightly baled bales would be good insulation and might not settle too much. 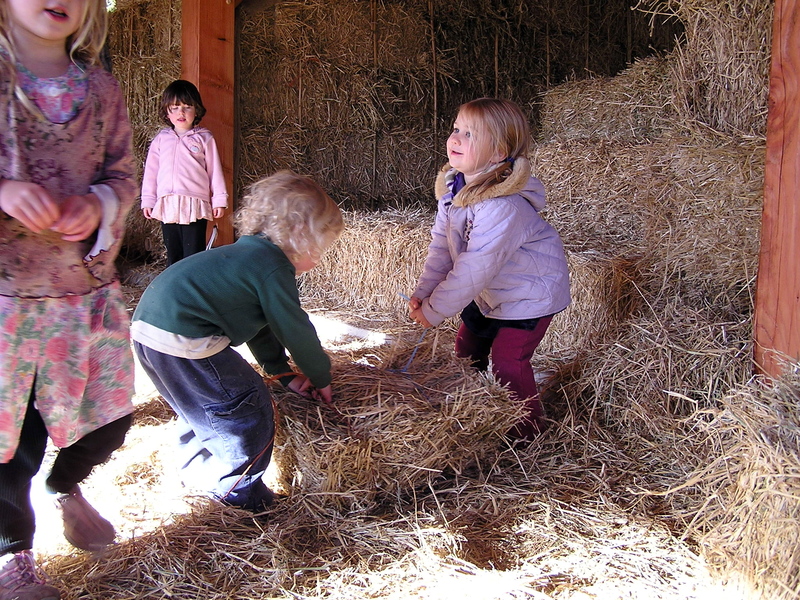 We were even able to incorporate the enthusiastic pleas of our little ones, giving them lots of jobs with the small bales we created for the small spaces, and with the continual cleanup of loose straw everywhere. 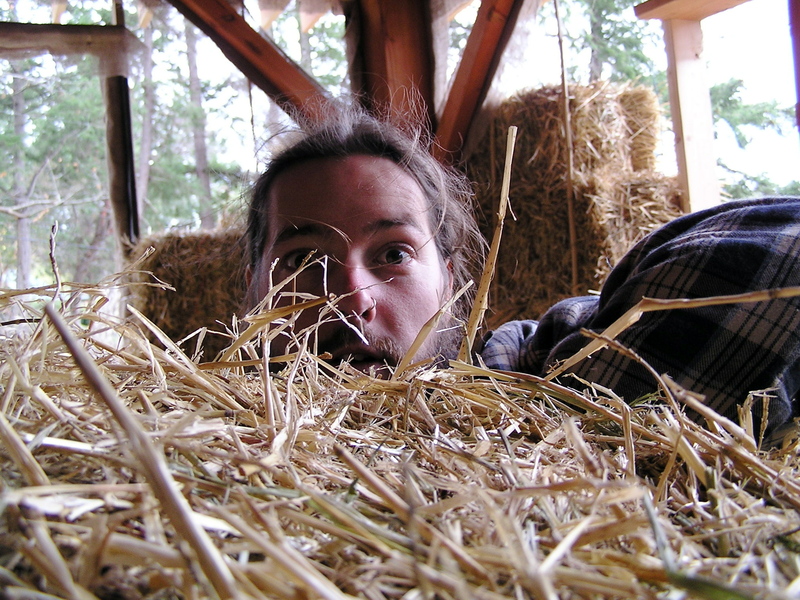 They mostly settled into playing on the constantly diminishing pile of bales, but it was with great satisfaction that I could say that our building materials double as a healthy play fort. I was also grateful for our decision when I spotted flocks of chickadees foraging through the litter for seeds and nest building material. I loved finding the occasional sprig of dried wild chamomile bundled up into our walls, adding an element of calm to the energy of the house. The last job was trimming. 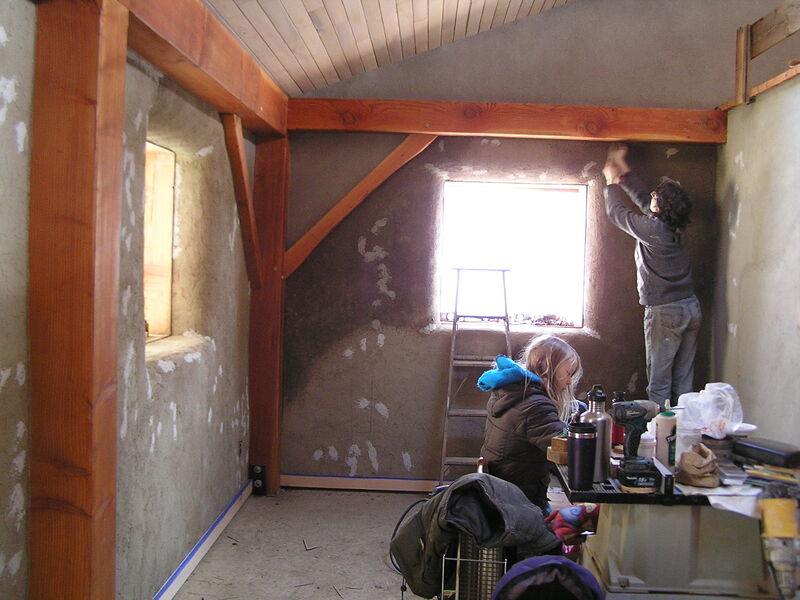 Colin used a grinder and gave every inch, inside and out, a careful haircut to get a smoother surface on which to plaster. 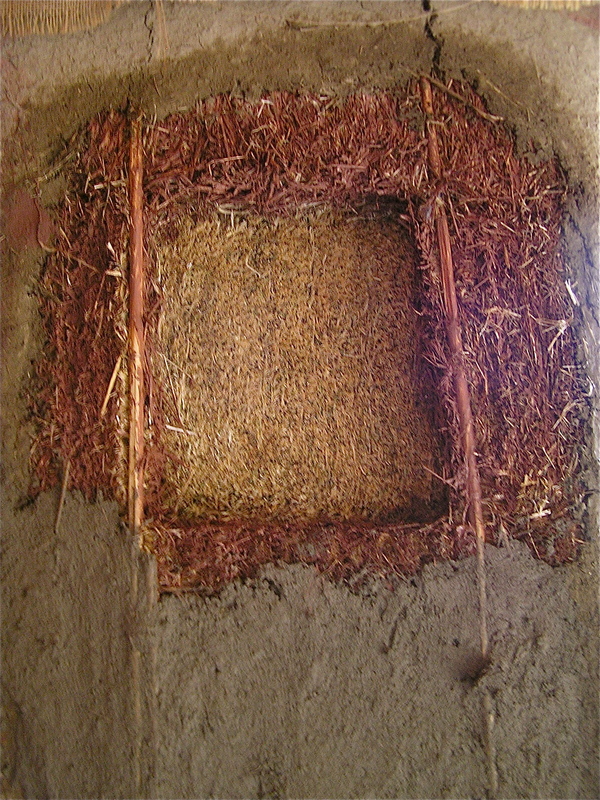 Then we did a bunch of stuffing- making little twists of straw and shoving them into any little cracks that are created between the bales or around the window framing. 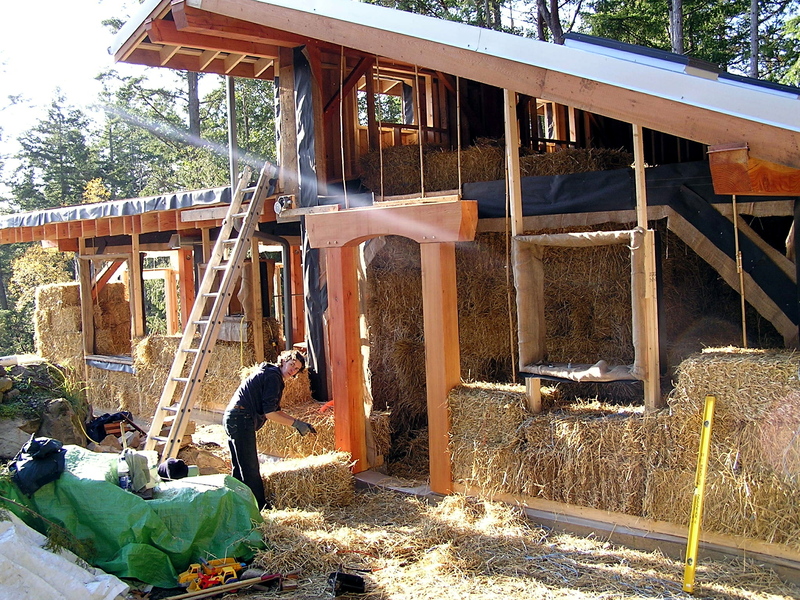 I am really grateful for the process we went through that arrived at the decision to build with strawbales for this house. 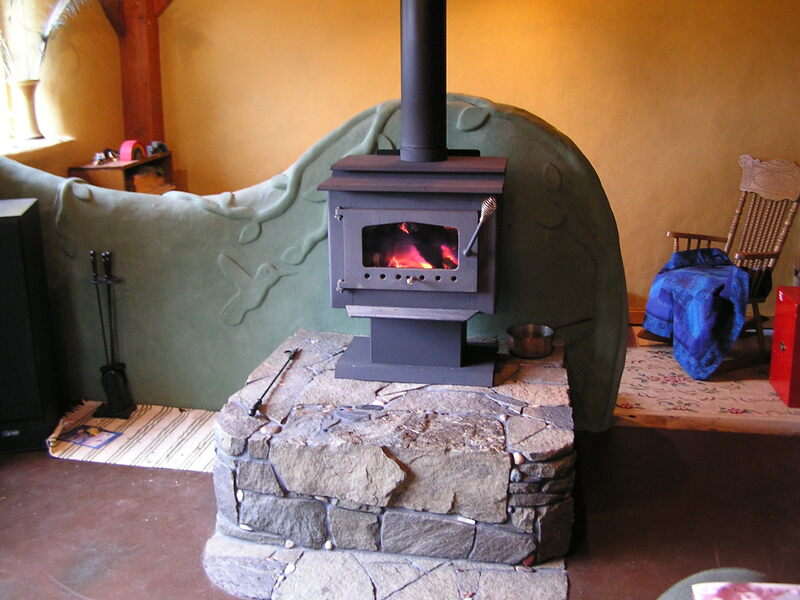 It has been a satisfying experience all along, from the many people that walked in and smiled with memories of family barns in their childhoods, or the soft cushiony sound of the acoustics as we played music perched on bales as benches, or knowing that any excess will go onto my garden paths or as summer mulch. 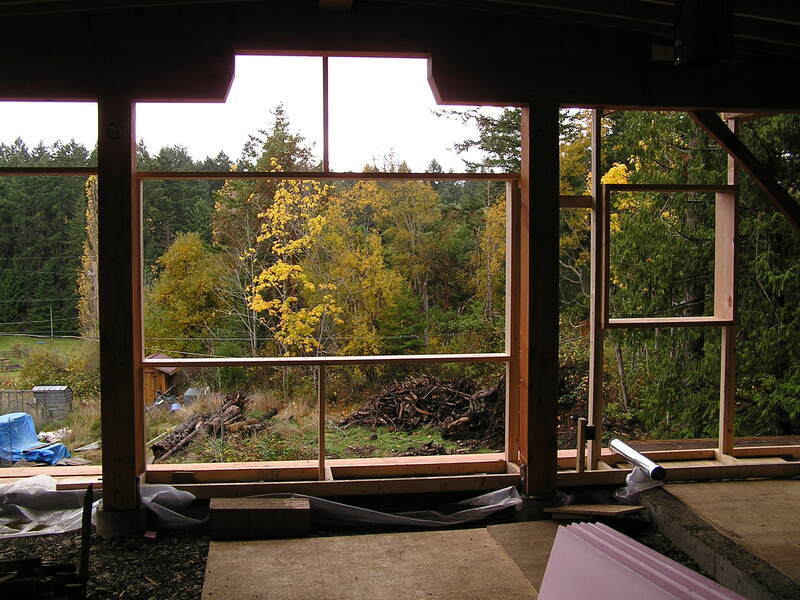 It is a building material that fits beautifully into the harmony of natural world, and creates those wide, adoring window sills that frame such glorious views of the world we honour and respect.